I may be the wrong person to review this. Or maybe I'm the exact right one. I am not a religious person. I have no religious background or education. I have not read The Bible. I come to Noah, director Darren Aronofsky's gritty re-imagining of 2007's Evan Almighty, with no preconceptions of what it "should" include or how it "should" treat the material. 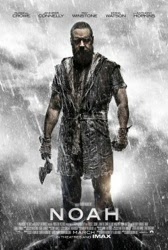 And while that will no doubt rub some people the wrong way -- there are many who judge a film's merits solely on its faithfulness to the source, be it biblical epic or comic book blockbuster -- it hopefully makes me qualified to at least judge Noah on its merits as just a film. As a film, it's good. Sometimes very good. It's full of gorgeous imagery, big ideas and bold, unapologetic choices -- the kind that Aronofsky makes in all of his movies. A through line can be drawn through all of his films, which focus on men (or, in the case of Black Swan, a woman) driven by an obsession that, if taken all the way to its conclusion, will lead to his or her destruction. 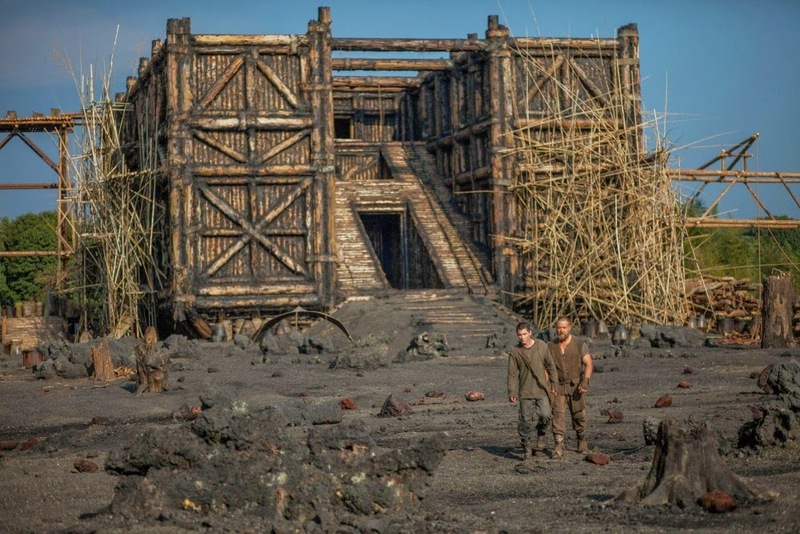 The crazy places that Noah is willing to go both visually and thematically is invigorating when the movie is at its best, particularly given the big-budget studio scale on which Aronofsky is working. The movie feels like he pulled one over the people in charge. Do I need to recount the plot of Noah? Russell Crowe plays the titular character, who is awoken by visions of the night of a great flood and all of humanity swallowed up in it. The Creator is speaking to him, he says, and sending him a message. Eventually, that message becomes clear: man was given a perfect world and ruined it with his greed and avarice, and will now be wiped out by a massive flood so that the earth can begin anew with only the animals to inherit it. Noah understands that he must build a massive ark to house the animals, which he begins to do with the help of his wife (Jennifer Connelly), his three sons and adopted daughter, Ila, while an army led by Tubal-Cain (Ray Winstone) prepares to take it. And then the rains begin. 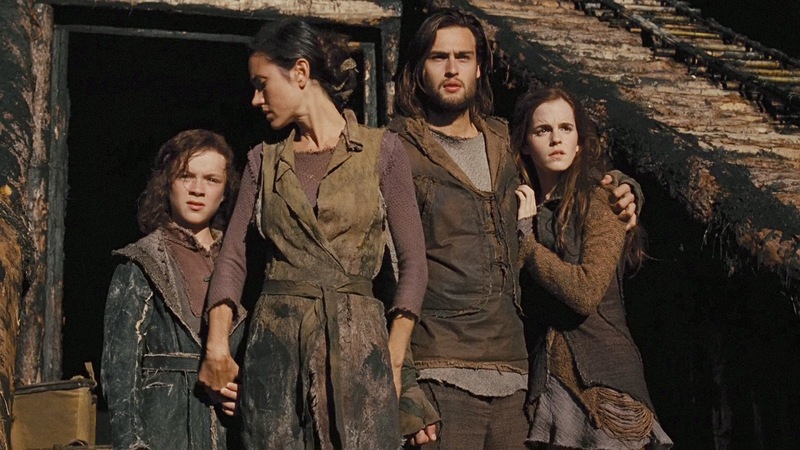 For its first hour, Noah is thrilling fantasy filmmaking -- it's a bible story by way of Lord of the Rings. The world Aronofsky establishes is beautiful and weird and the film poses all kinds of interesting questions about responsibility, faith and fatalism. Russell Crowe's Noah possesses a conviction that gives way to obsession, and it's easy to read the building of the ark as a metaphor for Aronofsky's own filmmaking process -- passionate, driven, daunting and including two of every animal. Russell Crowe feels dialed in for the first time in a while, and his tendencies to overact (put to such good use in The Man With the Iron Fist) are channeled into a stare that's all steely intensity. His performance is excellent; the rest of the cast, from Jennifer Connelly (whose big emotional speech just does not work) to Emma Watson to Logan Lerman, is less consistent. The reason it doesn't damage the movie more than it probably should is because this is ultimately the director's movie -- one that lives and dies by his choices. When there are sequences as dazzling as the montage that tells the story of all creation in a rapid-fire series of what looks like still photos, it's easier to overlook the wobbly acting. And did I mention the giant rock monsters? They're called Watchers, and they're all over this movie. Fallen angels cast out by the Creator and trapped in shells of stone, the Watchers alternate between helping Noah build the ark and laying waste to armies of men looking to steal it away. They are a terrific creation, all jagged faces and movements that feel like stop motion. When they go into action, it reminded me of the moments when Treebeard and the Ents finally enter the battle at the end of The Two Towers. They are also probably the greatest indicator that Noah has no interest in being a traditional biblical film; Aronofsky takes the source material as a fantasy story and approaches his film thusly. It provides a way in to the movie for a nerd like me who has been left cold by biblical films in the past, and also makes Noah a movie that feels like nothing else -- for a while, anyway. But Aronofsky doesn't just cast out the story of Noah in favor of making his own fantasy epic; for all of the criticism the movie has drawn in some circles (much by people who hadn't yet seen it), he treats the ideas of the source material with great seriousness. His film doesn't preach, it doesn't hold our hand and it rarely tells us exactly what we want to hear. It has some bleak things to say about mankind, who it argues, at times, are deserving of being wiped clean for the way they have treated the planet (Aronofsky is an environmentalist, and those messages are all over the movie; this may piss some people off, but it's hard to argue with the case he makes for treating the planet well and only taking what we need). It raises questions about the line between doing the Creator's will and madness -- about the burden of doing God's will and the toll that it takes. It is a movie about difficult choices, ones in which the fate of all life is literally at stake. Ray Winstone's Tubal-Cain, the self-appointed king and the film's version of the villain (though at times it seems more like it's Noah and others, dare I say, like the Creator Himself), is one of the film's biggest problems, as he feels transported in from another, much more conventional film. But at one point, he gives a speech about mankind refusing to lay down and die, and it's the exact kind of speech we've heard in countless epics from Braveheart to Lord of the Rings to Russell Crowe's own Gladiator. We should be on his side, as he is, in theory, speaking on our behalf. The problem is that a) he's the villain and b) we know the outcome of the story, meaning we know his speech is ultimately in vain. The flood is going to kill everyone despite their best efforts to survive, and if we are to accept the story of Noah that we have been told all our lives, we not only have to understand that fact but also agree that it is necessary. It's in the second hour that Noah turns into kind of a mess as the movie gets away from Aronofsky. It's the kind of mess only a well-intentioned filmmaker makes, as it is so bursting with ideas and themes the director wants to convey that they end up smashing into each other without enough room to breathe. The narrative gets muddled as characters leave the ark, return to the ark, leave the ark, etc. Because the movie isn't afraid to play out in grand, sweeping emotions and images, it can sometimes lend itself to unintentional comedy. I'm thinking specifically of Anthony Hopkins finally finding berries. Worst of all, though, is that some of the major beats feel overly conventional, which is weird because so much of the movie completely defies convention. Here is a movie that in one scene shows a famous biblical figure allowing all of mankind to be destroyed in a flood, listening to their screams but refusing to help. It shows an Oscar-winning movie star chasing after a newborn baby with a knife. And then it has characters spell out all of the themes in clumsy dialogue and characters holding hands in a version of a happy ending that feels too commercial in a movie that's anything but. At times I think I love the idea of Noah more than I love Noah itself. Movies like this are what I would often affectionately refer to as an Ambitious Failure -- except that Noah, while insanely ambitious in the best possible way, is not a failure. It overreaches. It turns into kind of a mess. But it's the kind of movie of which we need more. Religious beliefs aside (whether or not you and I agree does not matter, and if we don't we never will), we must be glad that this movie exists. Aronofsky is a passionate, visionary filmmaker. Yes, his movies can be indulgent and yes they can be overheated. Noah, at times, is guilty of both. But isn't he exactly the kind of director who should be given $100 million to make a big studio movie? We complain so much about the soulless product the majors put out month after month that we must be able to appreciate ambitious art when it comes along. It can be a mess, but I would gladly take 20 more messy movies like Noah before another Transformers. Great review, Patrick. I've been wanting to see it but was waiting for someone I trusted to see it first before I embarked. I love religious films when they take the subject matter seriously and actually confront the issues at stake instead of just preaching to the choir. Sounds like this is a good one for me. I also adore how you invoked Tarantino describing Pauline Kael's review of Bonfire of the Vanities with your sentence, "It's the kind of mess only a well-intentioned filmmaker makes..."
I think everyone's mileage will vary with Noah, but it's a movie that deserves to be seen just for what it tries and often succeeds. More big-budget movies should be like this. Vince Mancini at FilmDrunk wrote a really good review of the movie where he describes it as Aronofsky's attempt to make literal sense of a fable, which I think is a really interesting and accurate take. Excellent take on the movie, and I am glad to see there are people who don't get muddled in with the subject material. Just look at the IMDB boards where you need to a fine-toothed comb to find insightful comments on the film. All I find on that board are comments comparing the watchers to transformers and crazy religious folk criticizing or embracing the film (even though like you say, they probably haven't seen it). The second hour is somewhat problematic, with the berry searching Methuselah being downright strange. But I still think the movie as a whole was very entertaining. The movie definitely suffered when Crowe (or Winstone) wasn't on the screen. I like Emma Watson, but I think she was trying too hard for this one. Connelly wasn't great either, but I suppose it's difficult to play opposite Crowe in that type of role. The effects were outstanding, but they may have been better served using real animals in some scenes (instead of entirely CGI). I really like the modifications Aronfsky made, as a straight adaptation of Noah wouldn't have been nearly as entertaining. This is the type of movie that I love because Aronofsky took such huge risks in telling the story of Noah the way he wanted (not the producers or believers). It's good to see that it performed well at the box office, as I wouldn't mind seeing similar religious epics told this way in the future (not straight-forward dreck like Son of God). I hope Crowe receives some award consideration, but maybe that's because I am happy to see a glimpse of his greatness that we haven't seen from him in years. Initially I had no interest in seeing this movie. After reading this column I am enticed. Though Patrick's criticisms are on point, I'm wondering if the messiness of film may not be a byproduct of the source material. I don't want to offend any people of the religious persuasion, but I feel like the Old Testament had its share of pacing issues, overabundant characters and sweaty subplots. Not to mention a severe lack of Ray Harryhausen-esque rock monsters (those gotta be the coolest CGI creations I've seen in years). On a more serious note, I live in the Bible belt and let me tell you, the audience that accompanied my Noah viewing did not enjoy the liberties Aronofsky took. There were walkouts. Many who stayed frequently sighed at the rock monsters and muttered things like "That's not what really happened." The lady next to me took to the concession stand multiple times in protest (or maybe hunger, I probably should have asked before jumping to conclusions). In one especially creepy moment I heard someone recite passages from The Bible under their breath during the big flood sequence. Needless to say the screening marks one of my most memorable movie going experiences. So, you know, I sort of expect box office a drop off next week... at least in my region. There will definitely be a drop off at the box next week when another superhero movie opens: Captain America 2. Good review Patrick. I feel conflicted about Noah, since I definitely agree that it's refreshing to see all the things Aronofsky gets away with in a big summer blockbuster. I enjoyed the fantasy elements as well as their blending with other Genesis stories, and I thought the cast succeeded well with some choppy dialogue. But I felt that from scene to scene, Aronofsky would master a tone of dread, panic, and claustrophobia only to repeatedly take things another step too far. I feel like a total hypocrite, since I admit that there isn't a positive way to spin a story in which all mankind dies a horrible drowning death, but much of the film seemed just a little too mean to be redeemed by a couple of feel-good speeches at the end. It's another one of those movies where you wonder how it ever secured a PG-13. But I do agree that I'd rather see more ambitious blockbusters like this, and whether I loved it or not, it has given me a lot to ponder and discuss. Thanks, Myke. The feel-good speeches at the end are among the scenes that didn't work for me, but one of the things I like about the movie is the way that Aronofsky seems to be wrestling with how such mass death could be possible -- how it could "happen" (not that it happened, but you know what I mean). It's easy to swallow when it's just a line or two in a story that gets passed down, but another thing to watch it all play out. That aspect of the movie was fascinating to me. The only scene that went too far for me was when Noah had the knife near the end, but the too far-ness was entirely the point. I do appreciate that Aronofsky is trying to demonstrate just how panic-stricken and ugly such a catastrophe would be, and I do understand that it's a part of his aim. It's just the quick shots that linger that throw me off, the split-second view of an animal being ripped apart or the loudness of somebody's bones crunching under trampling feet. I know it's all adding up to an intriguing idea, but there's a disconnect between what my mind knows is an interesting concept and what my heart feels is an inch too much. In those cases I usually have to put the intellect aside and go with my gut, though I definitely wouldn't knock the film for it because it's just a small piece of something that didn't entirely work for me. Nice review, I went and checked it out based on this. I just got back from seeing this today. My view may change with subsequent viewings, but I think I really enjoyed this. I think I agree with most of what youve said, Patrick, except I dont think the flaws dragged the whole down as far for me as they did for you. If the movie had another 30 minutes on its run time I think it would have been much better for it, despite it already being a fairly hefty length. The action/fight climax tried to cram three different conflicts into one fight, resulting in nearly all of them feeling anticlimactic, also I would have loved more time spent on Noah's breakdown post-crisis once he is allowed to reflect on what had happened. Alternatively, it could have supported a 2 part-er, with the break between movies occurring once the arc is freely floating. All in all, very enjoyable with all performance reaching the "good enough" standard while varying in relation to each other, IMO. Glad you were inspired to give it a shot. I have problems reconciling the use of Tubal-Cain in the second half, and I'm totally with you on Noah's post-breakdown reflection. It's all dealt with in such a hurry that it needed to be either a) longer or b) cut completely. I think he had a role there, as a snake in their garden, and then what that says about Ham as a good man with flaws. Structurally, I think without tubal-cane on the boat the movie would have felt much more like two parts rather than one whole. He provides a consistent antagonist which helps. While it could have been managed better I think it's absence would have been missed. I am not the biggest Ray Winstone fan but in theory I liked the Tubal-Cain character because he is the placeholder for the common sense part of the faith vs. common sense debate. It's like a big budget Philomena is what I'm saying. I liked the Tubal-Cain stuff in the first half if only so we can get the inspirational speech that subverts everything we're used to in movies. It's just the stuff on the ark that I like less, because I feel like there are enough dramatic balls in the air once on the ark that the Tubal-Cain plot feels shoehorned in from a much more conventional movie. I thought Philomena WAS the big budget Philomena. How else do you explain all that CGI? Yeah, the scenes with Tubal-Cain on the ark were problematic, I agree. I love the part in Philomena where the nun turns into the scorpion king. Was Tubal-Cain shoehorned in to make us think that perhaps Noah's (or his family) lives were in danger? 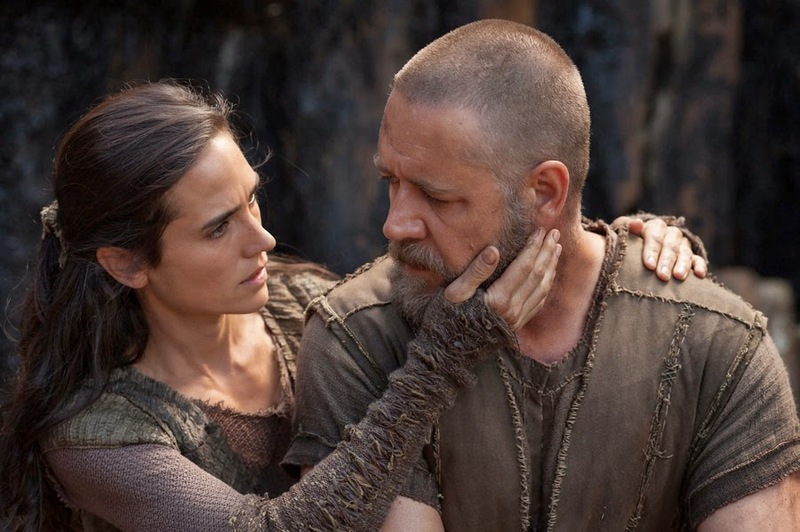 I know Aronofsky wasn't going to go as far as killing Noah, but for the uninitiated maybe they thought there was a chance. He did make drastic changes from the version in the bible, so maybe he was willing to go to that extreme. Of course that wouldn't have worked, and it would have been both cliche and unnecessary. But having Tubal-Cain on the ark adds an extra level of terror beyond what we already knew was going to happen., Which is why some have said the second half of the movie has a horror vibe to it. Then there's the scene where he just starts eating that lizard while it was still alive. I don't know what Aronofsky has against vegans, but that lizard-crunch was gruesome. It just felt to me like Tubal-Cain was around to be a more concrete villain when I really felt like his story was done. By that point in the movie, the internal conflicts were more interesting than a bad guy with a knife. Plus, Noah had already kind of become the villain. We didn't need another one. Aronofsky is very pro-vegetarian, and those messages are all over the movie too. It's another thing that got people riled up. Before I read this I could not have had less interest in this movie. Whether the film were to be controversial, anti-Christian, pro-Christian, fantastical, faithful, respectful or not, I just did not care one way or the other. Humanity? Getting wiped out again in a 125 million dollar "epic?" Count me out. But you've done that thing you do again. I've got to see this now, because an endorsement from you carries a lot of water (no pun intended). I guess I'm going to see Noah this week. I think I liked it even more than Patrick. It's an epic with a lot on its mind. 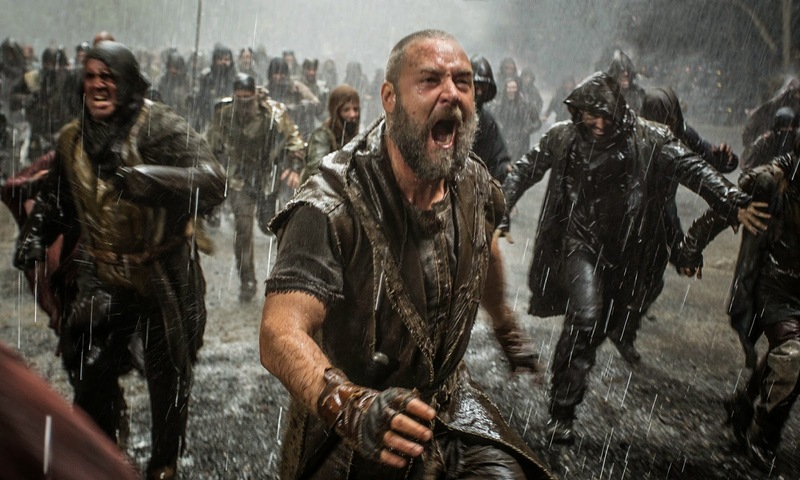 After hearing something like 60% of Americans believed in the literal truth of the story of Noah and the flood (I loved the comment about people walking out of the theatre because of Aronofsky's "liberties"), I was planning on ignoring this based on some sort of silly anti-religious principle but your review has made me see the light! Sounds well worth the watch and with the dearth of good movies playing at my theatre this week, I'm going to check it out for sure - great review, Patrick.